NAIROBI, Kenya -- Karibu Kenya, President Obama. Welcome to Kenya. For many Kenyans, the Swahili-language slogan will be more than just a polite greeting when the American president visits the country where his father was born, his first trip to Kenya since he was a U.S. senator in 2006. They see it as a homecoming for Obama, who has written with depth and emotion about his Kenyan roots but might not have time to explore them this time, enveloped as he will be by official duties and the White House security structure. "They take it really personally," Nelly Ngugi, customer relations manager at Cafe Deli in downtown Nairobi, said Wednesday of fellow Kenyans. Obama's visit is like "a brother coming back," she said. "Welcome Home Sir..." says a message on a fake cake (made of Styrofoam) with red, white and blue icing in a display case at the cafe. A large cardboard cutout of Obama sits at the entrance. Ngugi led an Associated Press reporter to an upstairs table where she said Obama sat many years ago, before he was a public figure and when the restaurant was called Green Corner. Obama is scheduled to arrive in Kenya on Friday, the first stop on his two-nation African tour in which he will also visit Ethiopia. In Kenya, Obama will address a meeting on international entrepreneurship and hold talks with Kenyan President Uhuru Kenyatta, who has said trade and security are key topics. The United States and Kenya are allies in the fight against al-Shabab, the Islamic militant group based in neighbouring Somalia that has staged numerous attacks in Kenya, including the mass killing of students at Garissa in April and the 2013 attack on Nairobi's Westgate Mall. Kenya has sent troops to Somalia, where the U.S. has carried out drone strikes against the extremists. Some critics have questioned Obama's decision to visit Kenya and Ethiopia because of their human rights records. Kenya's deputy president, William Ruto, is under indictment from the International Criminal Court because of alleged links to violence after the country's 2007 election, although similar charges were dropped against the president. Washington had previously put more pressure on Kenya to implement "internal reforms" but the relationship is rapidly evolving, "mostly because of the common security needs of the two countries," said Jens David Ohlin, a law professor at Cornell University in the United States. Ohlin said in a statement that he expects more military co-operation between the allies. For Kenyan artist Evans Yegon, Obama's visit is a source of pride. In recent months, he painted two images of the American president, including one of Obama wearing a cravat and a velvet coat aimed at evoking the clothing of past centuries as well as predecessors such as Abraham Lincoln and George Washington. The other painting is a colorful close-up in which it is not immediately obvious that the subject is Obama. A smiling image of Obama adorns the cover of this month's edition of a Kenya Airways magazine. U.S. and Kenyan flags line the road leading from Nairobi's main airport as well as some downtown areas. 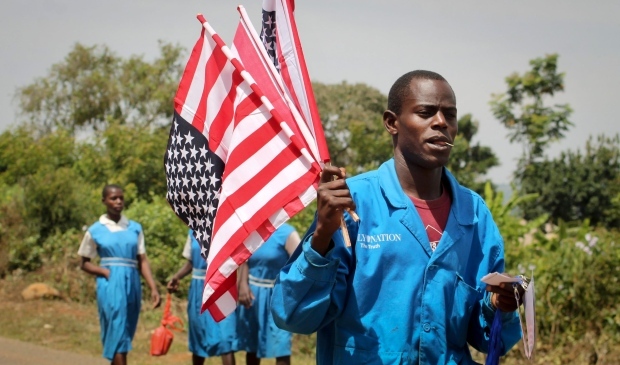 A Nairobi billboard advertises an August show titled "The Obama Homecoming" by local comedian Eric Omondi, whose image in suit and tie is flanked by the Kenyan and U.S. flags. Some Kenyans have even adopted a rousing segment from an Obama speech as their cellphone ringtone. Sarah Obama, the matriarch of the Obama family, said in her home village of Kogelo in western Kenya that she will not feel bad if the president does not visit her. Obama, who visited Kogelo in 2006 and referred to her as "Granny" in his memoir "Dreams from My Father" saw her last year in the United States. "He has to come to discharge his duty," said Sarah Obama, the second wife of Obama's grandfather who helped raise his father, Barack Obama Sr. "He is a son here. I cannot be angered by him not coming to see me."